OK, this one will take a bit of explanation. Bear with me. First, who is Michael Crabtree? According to Wikipedia (which, at the risk of making myself the target of derision, I still say is the single best source of information on the Internet), "Michael Crabtree is an American football wide receiver who was selected by the San Francisco 49ers of the National Football League in the 2009 NFL Draft. He was drafted by the 49ers with the 10th overall pick in the 2009 NFL Draft, but currently remains unsigned by the team." 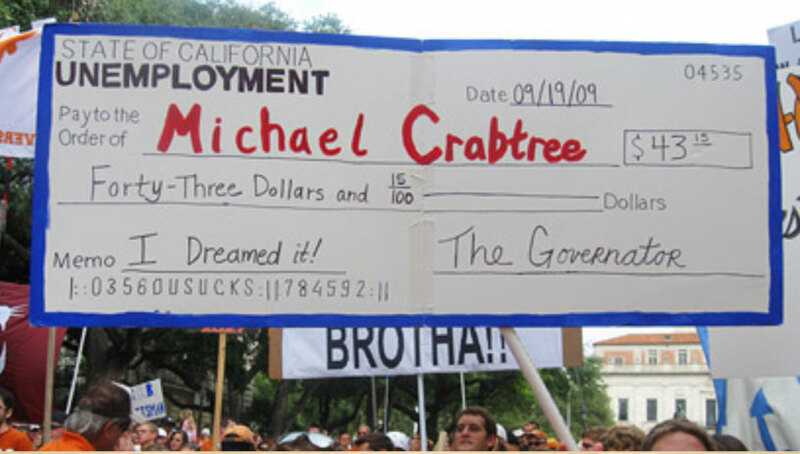 OK, that explains why Michael Crabtree might be receiving an unemployment check from the Governator. After the jump, let's bring the story a little closer to home. Saturday morning was sunny and pleasant, a perfect day for Ellen and me to go to the Cottonwood Art Festival with Walt and Ruth. By 2:30 PM, the time we got around to going, the clouds had moved in. By 3:00 PM, minutes after we arrived at the park and were strolling among the booths, the rain sprinkles began. No umbrella. One wheelchair. A walk of several blocks back to the car. Luckily it was a sprinkle, not a downpour, making the whole outing an adventure, not a disaster. All in all, a good time was had by all. It was a perfect night for homecoming football. Clear skies. Comfortable temperatures. Berkner favored to win. The team struggled a bit on offense with penalties and an inability to get the triple-option play working, but with the defense shutting down Creekview all it took was a few big plays for Berkner to win this one. The team's #10 ranking in the DFW area is secure for another week. Next week's game against Lake Highlands will test this team. The Mighty Ram Band performed most of their competition program at halftime. It looks like it's shaping up to be a winner. Wish the band luck at next Saturday's BOA competition at UT-Arlington. Go Berkner! City of the Big Shoulders"